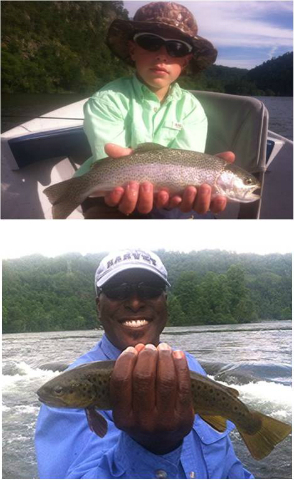 We are in the midst of a wonderful summer season on the Hiwassee, July was great and August will be too. 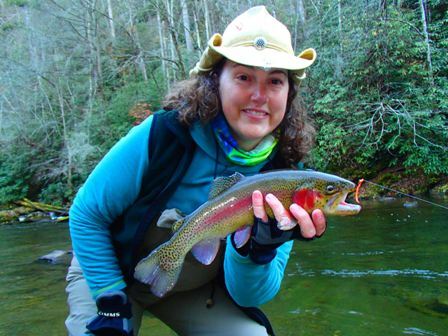 Plenty of water, good flows and cool temperatures have the browns and rainbows "popping" at the surface. Here are a few pics from recent trips. We need your face in one of these. The Isonychia hatch continues to be the name of the game for the afternoon.This is probably the largest and longest hatch we have experienced in years. YES - it is double dry fly time. If you are greedy enough, fish two dries in tandem. It works. Come have a smoked chicken on the river with us and catch a bunch of fish on dryflies in your T-shirt, shorts, and flip flops - It doesn't get any better. Our signature hatch is On ! 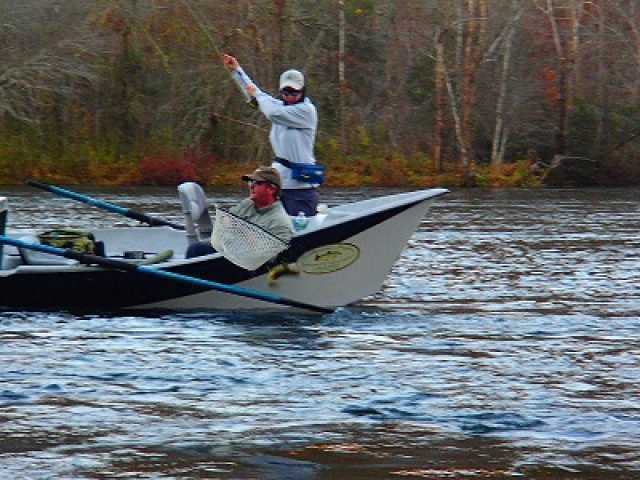 The Hiwassee is known for its great drift boat dry fly fishing. Hendricksons, Blue wings, sulfurs, caddis, stoneflies, and terrestrials. But it is the Isonychias in the summer that really get the blood pumping. Also called slate drakes, these are our largest mayfly species. They hatch sporadically during the summer and keep the fish looking up. They have just begun. As with the rest of our hatches this year, we are seeing above average numbers of these big bugs. 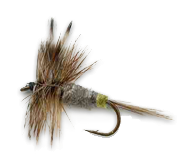 We fish the big dark colored parachute style dry flies in our guides favorite patterns. This is what we wait all year for. The next 45 days will be the most awesome dry fly fishing of the season. Give us a call and lets have some fun! Hello Southeastern Fly Fishers ! 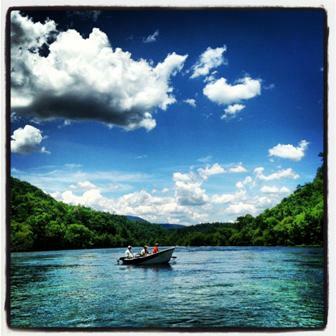 Just a note to confirm our excellent spring / summer drift fishing conditions on the Hiwassee River. Our lake is now slightly above summer pool and TVA is currently running our preferred flow schedule. 24 hour generation during the week with some low water mornings on the weekends. Our water temps are also exceptionally cool throughout the river due to the long, cold spring. We are set up for some great fishing throughout the summer. The river currently has the largest fish population that we have seen in over 10 years. The bugs are loving it too! We are having excellent hatches with blue wings, sulfurs, cahills, and more caddis of every kind than we have seen in years. The June and July Isonychia hatch should be epic this year. This is one season on the Hiwassee that you will not want to miss. Call now for good dates throughout the summer. The weather has FINALLY broken. Spring has arrived. The fishing report and forecast for the season could not get much brighter. WE have tons of bugs on the Hiwassee now. We are seeing black caddis, quills, and of course the Hendrickson mayflies. Both nymph and dry fly fishing is crazy and will continue to be strong. The quality of fish released has steadily increased over the last couple of years due to good flows, temps, and regulations. We are really enjoying ourselves these days on the Hiwassee. There are true trophy fish possibilities here now. The remainder of this month and May will bring drift opportunities on the upper river as well as some great drift / wade combo trips that we don't get too often. The cold, wet, long winter is paying us big dividends in the way of good cold flows and great hatches. I think we are going to see sulfurs at the stairstep rapids this year in May and June, just like we are supposed to. It is with great pleasure that I can report that our sister tailwater over the hill is on fire. We have not fished much here in a couple of years. It is ready to rock and rollnow. It is a great combo with the Hiwassee or an alternate if conditions indicate. If you are like us and haven't been on it lately, call and book a trip. It is working now. Come and spend a day with us on the river soon. The fish miss you. Spring TIme Fishing is at it's Best! The Tennessee Valley Authority has been giving us a mixed bag as far as the release schedule goes, but that’s about the only uncertainty that we have on the river right now. 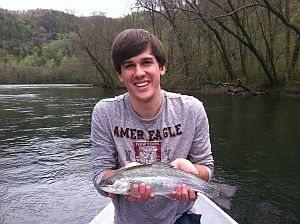 The fishing here on the Hiwassee is good. Our guides are reporting high catch rates using a wide variety of flies and spinning tackle. All the standard nymph patterns seem to be working very well, but the bead head prince and a bead head Cadillac pheasant tail seem to on the top of the list. We are having some very nice hatches on the water. Hendrickson’s have been coming off for the past month along with a nice mix of other bugs. As May gets closer we will start seeing more of our Sulphurs as the month goes on and the dry fly fishing will be excellent. 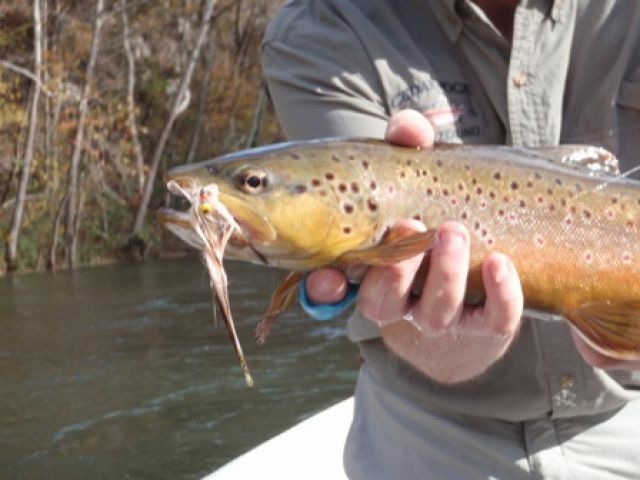 If you planning on fishing the Sulphur hatch here on the Hiwassee be ready with a variety of patterns to match the hatch as sometimes the fish will get picky. If you have not fishing on the Hiwasse River lately, then you need to come see what you have been missing. Read more: Spring TIme Fishing is at it's Best! Well everyone has been hearing us talk about how great our fall and winter fishing has become the last couple of years with the new Hiwassee River Delayed Harvest regulations. This past week has been no exception. Absolutely fantastic fishing! As good as it gets! Perfect weather, perfect conditions, and no rec floaters. Solitude on the river. We are catching lots of fish with some real quality trout coming to the nets. We really want to show this great "secret season" fishing to more of our folks. Stuff this good needs to be utilized. So for your angling pleasure we are offering a season opener super special. A day on the water utilizing this tremendous fishery for just $329 for two anglers. And no need to ask - it includes smoked chicken and a thermos of hot coffee. So put on your lightweight capilene (it's not that cold) and lets go do it. Offer is good for January and February 2013. Check out these recent pics from some of our trips in November. This has been an epic fall so far and we are right in the middle of great fly fishing that will turn into a winter blitz in 2013. December and the Holiday Season are always great times to be on the water here. The rubber hatch is gone and we have the river to ourselves. December weather is usually very mild and this year looks to be no exception. Both the Hiwassee and Tellico rivers are on fire. 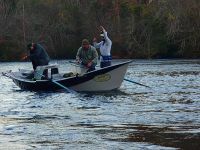 We are enjoying the opportunity to catch quality fish on both rivers with a variety of techniques. Several times a week we are getting those magical afternoons when the little blue wings decide to pop and the dry fly fishing goes nuts right up until you can no longer see your fly. We have measured really cool water temps for the last two years on the Hiwassee river and hold over has been very strong. Couple this with the delayed harvest along with the catch and release regulations and it makes for some real bruisers on the river. We also saw our first shad coming from the powerhouse on November 10th. 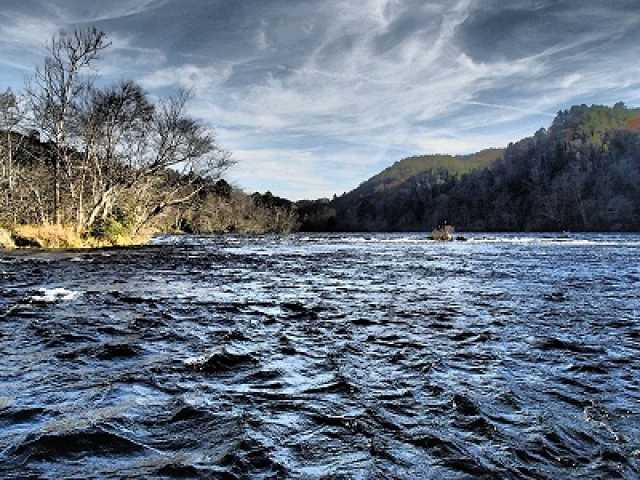 Come fish with us during the DH season on either of these fine rivers. Float or wade the next 90 days will be hard to beat. Holidays Gift Certificates are available now - great to give or receive! Here's a quick update for the Hiwasse and the Tellico Rivers. Delayed Harvest programs are in effect on each river. The TWRA seems to be really trying to make these programs work. We are seeing high numbers of fish on both pieces of water. The average size of fish being caught seem be a little larger than previous years. If everything carries on the way it's been going then the fishing should be great though the winter season.